Lib Dem deputy leader Jo Swinson has said the party needs to change in order to attract new voters. Ms Swinson, who was a minister in the coalition government, also refused to rule out a leadership challenge when Sir Vince Cable steps down. Speaking to Sky News’ Sophy Ridge On Sunday, she said: “We’ve got the ingredients to be able to challenge the other parties, we’ve got the infrastructure of parties right across the country in terms of local associations, candidates, the whole idea of a centrist party gets talked about endlessly but doesn’t really get off the ground. 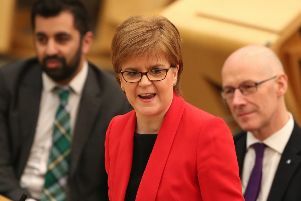 The East Dunbartonshire MP was later asked if she would consider running for the leadership of the party, to which she responded: “There’s no vacancy at the moment. Ms Swinson also told how she hoped the Labour Party would shift its position on a second EU referendum after an intervention from London Mayor Sadiq Khan. Mr Khan, writing in the Observer, insisted that the people should be given the chance to reject a Brexit deal that will “be bad for the economy, jobs and the NHS”. She was later asked on BBC Radio 5’s Pienaar’s Politics if she worried about a potential public backlash if a second vote was granted. She said: “What worries me is seeing our country heading off the edge of the precipices towards a no deal Brexit where we are talking about potential food shortages and medicines being stockpiled and what that’s going to do to our economy.